1Ph.D. in nursing, Assistant Professor of Mazandaran University of Medical Sciences, Sari, Iran. 2M.Sc in intensive care nursing, Department of nursing, Ayatollah Rohani Hospital, Babol University of Medical Science, Babol, Iran. 3Ph.D. in Biostatistics, Assistant Professor of Mazandaran University of Medical Sciences, Sari, Iran. 4Psychiatrist, Fatemeh Zahra Heart Center, Mazandaran University of Medical Sciences, Sari, Iran. *Address correspondence and reprints request to: Maryam Sohrabi, M.Sc. Intensive care nursing, Department of nursing, Ayatollah Rohani Hospital, Babol University of Medical Science, Babol, Iran. Jannati Y, Bagheri-Nesami M, Sohrabi M, Yazdani-Cherati J, Mazdarani S. Factors Associated with Post-Surgical Delirium in Patients Undergoing Open Heart Surgery. Oman Med J 2014 Sep; 29(5):340-345. Objective: The objective of the present study is to determine the incidence of delirium and the associated factors in patients undergoing open heart surgery. 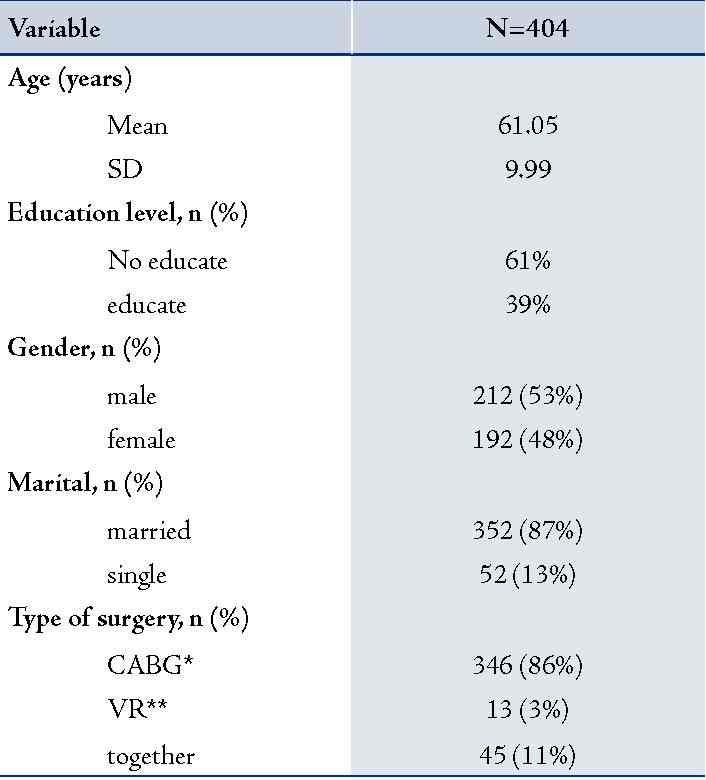 Methods: This is an Analytic-descriptive study conducted on 404 patients undergoing elective open heart surgery in Fatemeh Zahra Heart Center, Sari, over the period of 6 months from July to December 2011. Sampling was achieved in a nonrandomized targeted manner and delirium was assessed using NeeCham questionnaire. A trained nurse evaluated the patients for delirium and completed the risk factor checklist on days 1 to 5 after surgery. Data analyses were accomplished using survival analysis (Kaplan-Meier and Cox regression) on SPSS software version 15. Results: We found that variables, including ventilation time, increased drainage during the first 24 hours, the need for re-operation in the first 24 hours, dysrhythmias, use of inotropic agents, increased use of analgesics, increased arterial carbon dioxide, lack of visitors, and use of physical restrainers were associated with the development of delirium. In addition, we found a delirium incidence of 29%. Conclusion: Diagnosis of cognitive disorders is of utmost value; therefore, further studies are required to clarify the risk factors because controlling them will help prevent delirium. Keywords: Delirium; Heart surgery; NeeCham Confusion scale; Cognitive impairment. As few studies have been conducted in Iran concerning delirium and its associated factors in cardiac surgery; therefore, the present study was undertaken to determine the incidence of delirium after open heart surgery and the associated risk factors. It was started by determining the incidence of delirium using NeeCham questionnaire, and then followed by evaluating post-surgical risk factors. This is an analytic-descriptive study conducted on 404 patients, whom underwent elective open heart surgery in Fatemeh Zahra Heart Center, Sari, over 6 months spanning from July to December 2011. We calculated the sample size with a confidence interval of 95% and a mean prevalence of 50% (10%-90%),1,12,19,20 that obtained 404. Sampling was performed in a nonrandomized targeted manner. The inclusion criteria were elective open heart surgery (due to the need for primary evaluation for delirium prior to surgery) and age of over 18 years. The exclusion criteria were delirium on entering into the study, deafness, blindness, and aphasia, which made the patients unable to complete the questionnaire. Patients were assessed for delirium by NeeCham questionnaire, which is a screening instrument for nurses to evaluate the patient’s behavior rapidly at bed-side.21-23 This questionnaire is based on the criteria of DSM-III-R,21-23 and consists of three major subscales: information processing (attention, command, and processing orientation, scored 0-14), behavior (general appearance and posture, sensory motor performance, and verbal response, scored 0-10), and physiologic control (vital signs, oxygen saturation level, and urinary continence control, scored 0-6). It yields a total score of 30 points. The patient will be categorized under any of the following four groups according to the score he/she obtains: healthy (27-30 points); stupor (25-26 points); mild delirium (20-24 points); and severe delirium (0-19 points). In addition, the questionnaire displays high sensitivity and specificity. Completing the questionnaire takes 8-10 minutes, so it is not demanding on the nurse because it can be completed during the routine activities and observations of a nurse. Therefore, the questionnaire is a reliable tool for the assessment of delirium by nurses in the public wards. It has been recently used on non-intubated patients in intensive care units and the results of comparing the diagnostic power of the two questionnaires, namely, CAM-ICU and NeeCham, on 172 non-intubated patients admitted to a general intensive care unit revealed that NeeCham identified delirium better than CAM-ICU. The result of this study indicated 87% sensitivity and 95% specificity for NeeCham.23 The criteria in this study for tool selection were its high sensitivity and specificity, its appropriateness for critically ill and non-intubated patients, and its simple application by a nurse. On the evening preceding the surgery day, all patients were evaluated by a psychiatrist to rule out primary delirium. Since the patients had to stay on intubation and receive sedative, the first 24 hours after the surgery was not considered. First day after the surgery, the patient who was rousable and non-intubated in the previous evening was assessed for delirium. A trained nurse evaluated the patients from day 1 to 5 after the surgery once a day. Due to the increased incidence of delirium in the afternoon and evening,1 the assessment was performed from 16:00 to 20:00. Selection of patients was done by nurses who were trained and informed about the inclusion and exclusion criteria. A checklist of post-surgical factors and demographic information was completed for each patient. Due to ethical considerations, any patient with symptoms of delirium would be reported to the head of the ward for treatment. We used descriptive statistics (percentage, mean, median, and mode) to describe the variables related to the patients and the incidence of delirium, and survival analyses (Kaplan-Meier and Cox regression) were performed to determine the risk factors for delirium. All tests were performed on SPSS software version 15. We found an incidence of 29% for post-surgical delirium. The patients’ age ranged from 35-85 years and most frequently belonged to the 56-60 year age group ([20%] 79 patients). Among the patients, 48% were women and 53% were men. Of these patients, 86% underwent CABG, 3% valve replacement, and 11% with both. 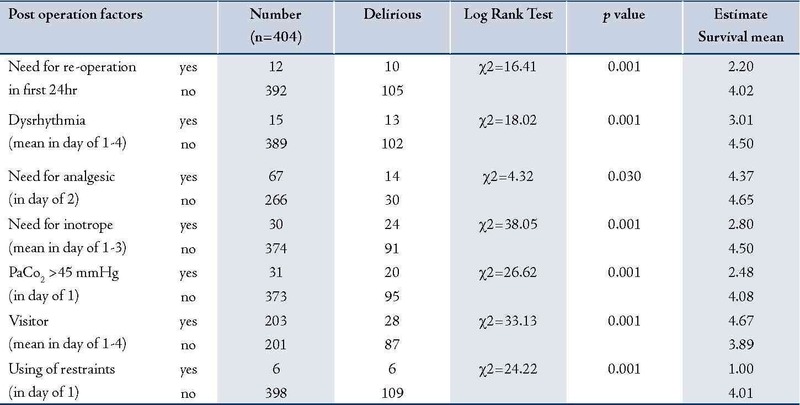 Table 1 represents demographic information of the variables, and Table 2 and 3 represent the post-surgical factors and their relationship with delirium. Table 1: Information of Demographic. In this study, a few things were taken into consideration such as ventilator time, need for re-surgery, drainage during the first 24 hours after the surgery, need for inotropes, increased arterial carbon dioxide, Arrhythmias that require intervention care, need for analgesic, using of restrainers (handcuffs and shackles) and visitors with post-surgical delirium (p-value <0.050). Table 2: Post operation factors associated with delirium with using test of Kaplan Meier. Table 3: Calculation of Relative Risk of post operation factors associated with delirium with using test of Cox Regression. According to these findings, delirium occurred most frequently in the first day after the surgery and no patient had delirium on the fifth day and most patients were afflicted with mild delirium. Different studies have reported the incidence of delirium to be 90%,1 47%,12 46%,24 32%,25 16%,19 and 10%.20 These discrepancies may reflect the difference in sample size, delirium assessment tools, study environments, and timing of evaluations. In this study, we evaluated the post-surgical variables of ventilator time, need for re-surgery during the first 24 hours, drainage during the first 24 hours, blood pressure, temperature, biochemical variables (hemoglobin, serum urea, serum sodium, and serum glucose), drain secretions on the subsequent days, arterial blood gas analysis (pH, decreased arterial oxygen, increased arterial carbon dioxide), infusion of blood products, need for analgesics, need for inotropes, visitors and physical restrainers after surgery. There was no significant relationship found between delirium and body temperature. All patients had almost normal temperature readings during the few days after the surgery (36.86 ± 0.26, average of temperature in non-delirium patients vs. 36.90 ± 0.23, in delirium patients). Only one study refers to a relationship between delirium and increased body temperature over 38¼C.19 This may be because we administered prophylactic antibiotics to prevent the infection of the site of incision and drains, as well as oral acetaminophen (4 times a day) for pain relief and this may have reduced fever in our patients. Other influential factors include hemoglobin level and infusion of packed red cells. The hemoglobin level of patients who developed delirium in this study was lower than the others; however, the difference was not statistically significant (9.45 ± 1.1, average of hemoglobin in non-delirium patients vs. 9.30 ± 0.83, in delirium patients). Patients were infused with packed red cells on different days based on their hemoglobin level, yet no relationship was found between infusion of blood products and delirium. In contrast, a previous study reports that infusion of more than 4 units of packed red cells per day is associated with increased risk of delirium.19 The discrepancy might be due to the fact that the patients received one unit of blood product per day and probably had less blood loss. Increased (>300 mg/dl) and decreased (<50 mg/dl) serum glucose levels may both lead to post-surgical delirium.19 The glucose level of our patients was more or less in the normal range, and we found no significant relationship between glucose level and delirium. This may have been due to the fact that blood glucose levels of our patients all fell within the 134-193 mg/dl range (161.37 ± 57.33, average of serum glucose level in non-delirium patients vs. 161.93 ± 55.45, in delirium patients). It has been found that increased serum urea level (>50 mg/dl) is associated with post-surgical delirium.19 Among the patients, those who developed delirium had higher levels of serum urea on all days of evaluation. The difference, however, was statistically insignificant which may have been due to the fact that serum urea levels in our study never fell out of the 18-37 mg/dl range (20.46 ± 5.82, average of serum urea level in non-delirium patients vs. 29.78 ± 10.95, in delirium patients). During the evaluation period, patients who developed delirium yielded higher levels of serum sodium. Nonetheless, the sodium levels remained within normal ranges and no significant relationship was found between sodium level and delirium. One study reports that increased serum sodium (>150 mg/dl) is associated with increased risk of delirium,19 while we found that the sodium level ranged from 137 to 139 mg/dl, which was within normal range (136.99 ± 1.1, average of sodium level in non-delirium patients vs. 138.85 ± 3.67, in delirium patients). Prevention or early recognition of delirium is important since delirium correlates with a prolonged hospital stay, nursing home placement, reduced cognitive and functional recovery, and increased morbidity and mortality. In patients who undergo cardiac surgery, delirium is associated with more postoperative complications. In addition, patients with postoperative delirium are more prone to have postoperative respiratory insufficiency; they have a significantly higher prevalence of sternum instability and are more likely to require surgical revision of the sternal wound.34 The risk factors found in this study help identify the patients who are susceptible to postoperative delirium, as a result, appropriate action can be taken in the proper time. Regarding the early recognition and/or detection of delirium in hospitalized medically ill patients, nurses—who spend more time at the patients’ bedside—play a crucial role and knowing these risk factors can reduce the incidence of delirium. 1. DeLeo FR, Otto M, Kreiswirth BN, Chambers HF. Community-associated meticillin-resistant Staphylococcus aureus. Lancet 2010 May;375(9725):1557-1568. 2. Howden BP, Davies JK, Johnson PD, Stinear TP, Grayson ML. Reduced vancomycin susceptibility in Staphylococcus aureus, including vancomycin-intermediate and heterogeneous vancomycin-intermediate strains: resistance mechanisms, laboratory detection, and clinical implications. Clin Microbiol Rev 2010 Jan;23(1):99-139. 3. Jevons MP. ‘‘Celbenin’’-resistant Staphylococci. BMJ 1961;1:124-125 . 4. Deresinski S. Methicillin-resistant Staphylococcus aureus: an evolutionary, epidemiologic, and therapeutic odyssey. Clin Infect Dis 2005 Feb;40(4):562-573. 5. Hiramatsu K, Hanaki H, Ino T, Yabuta K, Oguri T, Tenover FC. Methicillin-resistant Staphylococcus aureus clinical strain with reduced vancomycin susceptibility. J Antimicrob Chemother 1997 Jul;40(1):135-136. 6. Chang S, Sievert DM, Hageman JC, Boulton ML, Tenover FC, Downes FP, et al; Vancomycin-Resistant Staphylococcus aureus Investigative Team. Infection with vancomycin-resistant Staphylococcus aureus containing the vanA resistance gene. N Engl J Med 2003 Apr;348(14):1342-1347. 7. Askari E, Tabatabai SM, Arianpoor A, Naderi Nasab M. VanA-positive vancomycin–resistant Staphylococcus aureus: systematic search and review of reported cases. Infect Dis Clin Pract 2013;21:91-93 . 8. Aligholi M, Emaneini M, Jabalameli F, Shahsavan S, Dabiri H, Sedaght H. Emergence of high-level vancomycin-resistant Staphylococcus aureus in the Imam Khomeini Hospital in Tehran. Med Princ Pract 2008;17(5):432-434. 9. Dezfulian A, Aslani MM, Oskoui M, Farrokh P, Azimirad M, Dabiri H, et al. Identification and characterization of a high vancomycin-resistant Staphylococcus aureus harboring vanA gene cluster isolated from diabetic foot ulcer. Iran J Basic Med Sci 2012 Mar;15(2):803-806. 10. Azimian A, Havaei SA, Fazeli H, Naderi M, Ghazvini K, Samiee SM, et al. Genetic characterization of a vancomycin-resistant Staphylococcus aureus isolate from the respiratory tract of a patient in a university hospital in northeastern Iran. J Clin Microbiol 2012 Nov;50(11):3581-3585. 11. Bannerman TL. Staphylococcus, Micrococcus, and other catalase positive cocci that grow aerobically. In: Murray PR, Baron EJ, Jorgensen JH, Pfaller MA, Yolken RH, ed. Manual of clinical microbiology. ASM Press: Washington DC, 2003; 8: 384–404. 12. Brakstad OG, Aasbakk K, Maeland JA. Detection of Staphylococcus aureus by polymerase chain reaction amplification of the nuc gene. J Clin Microbiol 1992 Jul;30(7):1654-1660. 13. Clinical and Laboratory Standards Institute. 2011. Performance standards for antimicrobial susceptibility testing, 21st informational supplement. CLSI document M100-S21. Clinical and Laboratory Standards Institute, Wayne, PA.
14. Clinical and Laboratory Standards Institute. 2012. Performance standards for antimicrobial disk susceptibility tests. Approved standard, 11th ed. CLSI document M02-A11. Clinical and Laboratory Standards Institute, Wayne, PA.
15. Clark NC, Cooksey RC, Hill BC, Swenson JM, Tenover FC. Characterization of glycopeptide-resistant enterococci from U.S. hospitals. Antimicrob Agents Chemother 1993 Nov;37(11):2311-2317. 16. Willems RJ, Top J, van Schaik W, Leavis H, Bonten M, Sirén J, et al. Restricted gene flow among hospital subpopulations of Enterococcus faecium. MBio 2012;3(4):e00151-e12. 17. Périchon B, Courvalin P. Glycopeptide resistance, In: Dougherty TJ, Pucci MJ, editors. Antibiotic discovery and development. New York, US: Springer; 2012. p. 515-542. 18. Melo-Cristino J, Resina C, Manuel V, Lito L, Ramirez M. First case of infection with vancomycin-resistant Staphylococcus aureus in Europe. Lancet 2013 Jul;382(9888):205. .
19. ProMED-mail. Staphylococcus aureus, MRSA - Brazil: (SP) vancomycin resistant (VRSA). ProMED-mail 2013; 30 Jun: 20130630.1800166. Available at: http://www.promedmail.org/direct.php?id=20130630.1800166. Accessed July 26 2013. 20. Banerjee T, Anupurba S. Colonization with vancomycin-intermediate Staphylococcus aureus strains containing the vanA resistance gene in a tertiary-care center in north India. J Clin Microbiol 2012 May;50(5):1730-1732. 21. Chakraborty SP. KarMahapatra S, Bal M, Roy S. Isolation and identification of vancomycin resistant Staphylococcus aureus from post operative pus sample. Am J Med Sci 2011;4:152-168. 22. Saravolatz LD, Pawlak J, Johnson L, Bonilla H, Saravolatz LD II, Fakih MG, et al. In vitro activities of LTX-109, a synthetic antimicrobial peptide, against methicillin-resistant, vancomycin-intermediate, vancomycin-resistant, daptomycin-nonsusceptible, and linezolid-nonsusceptible Staphylococcus aureus. Antimicrob Agents Chemother 2012 Aug;56(8):4478-4482. 23. Gould IM. Clinical activity of anti-Gram-positive agents against methicillin-resistant Staphylococcus aureus. J Antimicrob Chemother 2011 May;66(Suppl 4):iv17-iv21. 24. Saha B, Singh AK, Ghosh A, Bal M. Identification and characterization of a vancomycin-resistant Staphylococcus aureus isolated from Kolkata (South Asia). J Med Microbiol 2008 Jan;57(Pt 1):72-79. 25. Alzolibani AA, Al Robaee AA, Al Shobaili HA, Bilal JA, Issa Ahmad M, Bin Saif G. Documentation of vancomycin-resistant Staphylococcus aureus (VRSA) among children with atopic dermatitis in the Qassim region, Saudi Arabia. Acta Dermatovenerol Alp Pannonica Adriat 2012 Sep;21(3):51-53. 26. Al-Yaqoubi M, Elhag K. Susceptibilities of common bacterial isolates from oman to old and new antibiotics. Oman Med J 2008 Jul;23(3):173-178. 27. Hamid ME, Mustafa FY, Alwaily A, Abdelrahman S, Al Azragi T. Prevalence of bacterial pathogens in Aseer region, Kingdom of Saudi Arabia: emphasis on antimicrobial susceptibility of Staphylococcus aureus. Oman Med J 2011 Sep;26(5):368-370.